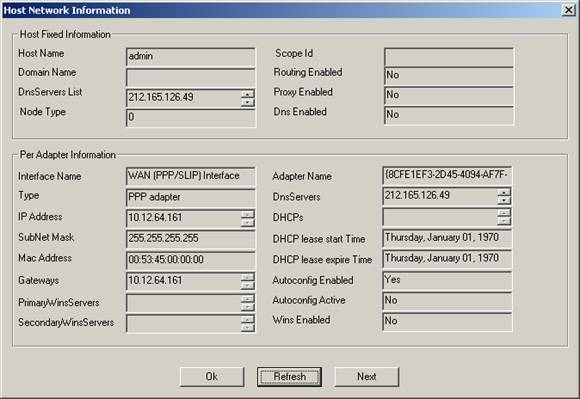 This dialog allows you to see the information about the local host and network. Host information, such as, host name, domain name, DNS servers list, node type, scope ID, routing enabled/disabled state, proxy enabled/disabled state, DNS enabled/disabled state and adapter information, such as, interface name, adapter type, IP address, subnet mask, mac address, adapter name, auto configuration enabled/disabled state, wins enabled/ disabled state, etc. are available. To refresh the information on the dialog click on the Refresh button.